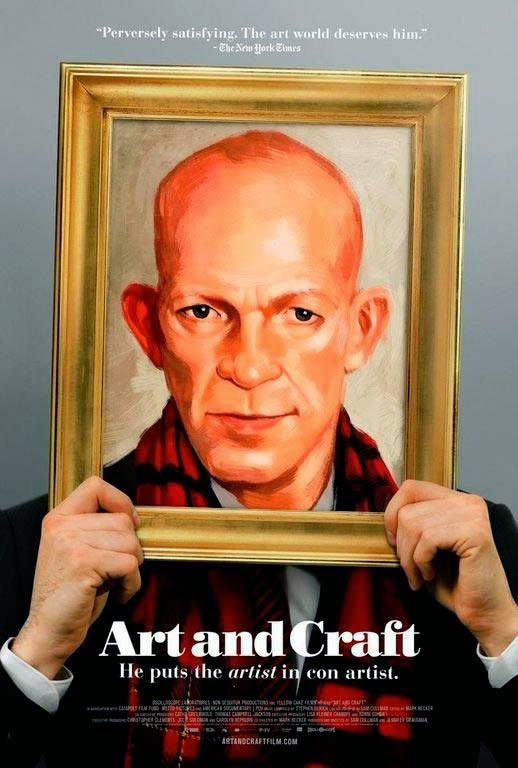 “Nothing's original under the sun,” asserts Mark Landis, the peculiar subject of ART AND CRAFT, a documentary directed by Sam Cullman, Jennifer Grausman and Mark Becker. Landis is a notorious art forger, whose clever copies of valuable artworks fooled curators at museums across the country for 30 years. Bald, with ears that rival Dumbo's and a languid Southern drawl that suggests that Billy Bob Thornton should play him, the 59-year-old Landis makes a most unlikely villain. The wide gulf between the outrage his deceptions provoked and Landis' mild demeanor makes the film enormously interesting and entertaining. The film shows Landis on one of his missions of deception, posing as the donor of a 16th-century crucifixion painting and telling a museum curator that he inherited it from his recently deceased sister, an avid art collector. “I'm glad you're helping to realize her wish,” says the curator, thrilled to have such a valuable donation. Landis' father was a Navy officer, and he and his parents traveled extensively due to his dad's postings; in Europe, young Mark became enamored of the treasures in the art museums the family visited. He stayed in hotel rooms while his parents dined out, and spent his time poring over museum catalogs. He also internalized a lot of movies and TV shows, romanticizing “The Saint” and wealthy art collectors he saw on television. While living in Brussels, young Landis started forging stamp cancellations for friends. At 17, after the death of his father, Landis was diagnosed with schizophrenia and spent time at the Menninger Institution in Kansas. He also studied art at the Art Institute of Chicago and in San Francisco, where he helped repair damaged paintings. In 1988 he returned to Laurel, Mississippi to live with his mother, and began making and donating copies of paintings to museums; in all, he donated faux pieces to more than 60 museums in 20 states, typically targeting smaller museums, which were less perspicacious than the larger ones. He even donated up to six copies of the same piece to different museums. “I just like copying things,” explains Landis, who has a special gift for remembering details and enough artistic skill to make convincing copies. His later pieces were merely well-disguised, blown-up photocopies, painted over with fake impasto, “aged” and mounted. After his mother died, Landis was bereft. His only remaining contacts with the outside world seem to be visits from caseworkers and his peripatetic trips to meet museum curators – “philanthropic binges,” he calls them. Matthew Leininger, the registrar at the Oklahoma City Museum of Art. Landis, under one of his many aliases, had offered the museum works including a watercolor by Louis Valtat, a harbor scene by Paul Signac, a self-portrait by Marie Laurencin, a drawing by Daumier and an oil painting by Stanislas Lépine. Laininger investigated the pieces and found that the same Signac, Avery and Laurencin pieces had been donated to another museum. Leininger uncovered Landis' serial deceptions and was infuriated. He made a career of pursuing and stopping this insidious art forger. Leininger became Javert to Landis' schizo Jean Valjean; his obsession even cost him his job. The film toggles between Landis in his cluttered, hermetic apartment and Leininger, now a stay-at-home dad, continuing his quest to conquer Landis. We also hear from other curators who admit they were duped by the fake donor's promise of valuable donations. “He got our soft spot, art and money,” says one. If Landis wasn't perpetrating the fraud for money (and is also mentally ill), how culpable is he? Opinions predictably vary. Robert Wittman, of the FBI Art Crime Team says, “It is a serious crime. He should be hospitalized or in jail.” His former caseworker, who still visits him at home, thinks Landis' “escapades” are harmless. Since he received no financial benefits, no actual laws were broken, making Landis a very peculiar figure in the annals of art forgery. As a result of Laininger's investigation, the Financial Times did a major story on Landis' serial deception; nonetheless Landis continued to donate forgeries in various guises priestly and secular. The filmmakers' cameras cover a 2012 exhibition at the University of Cincinnati's art gallery, mounted by Leinger and other curators on the theme of art forgery, including 60 pieces by Landis, who appears at the opening reception, awkwardly bantering with the wineglass-holding patrons. The film provides valuable insight into the roles of money and ego in the art world, and is a fascinating study of a true eccentric. Had he not already made a satire of the art world (PECKER), John Waters would have a field day with Mark Landis. 4 out of 4 stars.